Property 23: Nature villa with pool, Naturschutzg., Modern, secluded location with breathtaking views. Sea View. 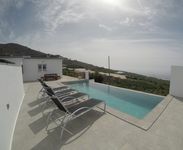 Property 27: Casa Tabladito with heated pool and fantastic sea views.